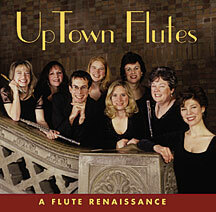 UpTown Flutes debuted at Weill Recital Hall, Carnegie Hall, NYC on June 15, 2002 as the recipient of the Artists International Special Presentation Award in Chamber Music. Their debut CD "A Flute Renaissance" was recorded at Upper Ridgewood Community Church in New Jersey and represents the June 15 program from Carnegie Hall. Program & Program Notes for "A Flute Renaissance"
Order your CD by contacting Virginia Schulze-Johnson at vschulze@drew.edu. The CDs are also available through Flute World. flutes@fluteworld.com.